I didn't want to get down into the weeds of working with JSon files to introduce some native animation on my website but, I knew (since animation and design is my specialty) I needed some sort of representation outside of my work. So I jumped into Photoshop and began designing what seemed to me, to be a fitting identity. Just netural enough while still having a relatively unique look to it. I didn't need it to accomplish a whole lot other than just to identify what I do and what I'm about. There's nothing to over the top in both the animation and design of it. Overall I identify with that kind of work. Although I have worked hard in the past (and continue to) growing my skill set and taste for different "genres" of design and animation, this felt like a good middle ground to strike as a first impression. I of course, knew I wouldn't be that person that put sound on the home page of my portfolio (that drives me absolutely bonkers), but I wanted to put together a piece that could still stand on it's own. I have been working in Final Cut Pro since the early 2000's so, that is naturally where I compose all my sound design. Yes, yes I know there's some severe downfalls there when it comes to working with audio but, I'm comfrtable there. Comfort = Freedom. Freedom = Creativity. (At least in this situation). Go hastle the folks that do it in Ae! Now I'm not here to dive into all the pitfalls of working with audio in FCPX, or working with anything in FCPX for that matter. I love the program. I really do. But, this is what one of my typical files looks like once sound design is completed. One of the updates they came out with in the last couple versions is audio lanes. Which overall makes it MUCH easier to keep your timeline organized. 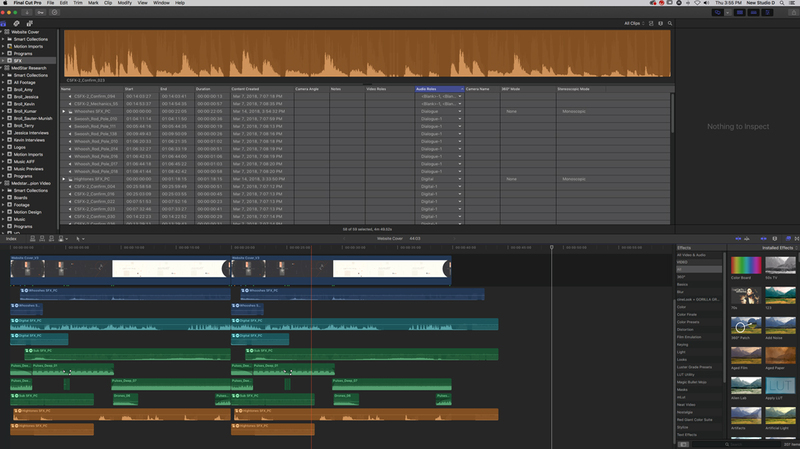 For example I've created a compound clip (FCPX's version of Pre-Comps) that held all of my electronic blips, and bleeps. Another compound clip consisted of my lower end swells and drops, so on and so fourth. Although it's kind of a pain to make tweeks according to your master timeline within those compound clips, it is deffinitely an easier way to navigate your timeline. I've got projects from the past that were simply STACKS on STACKS of SFX laid out in no particular order. I would give my most valiant try when starting a project to stay organized but, because of the fact you can't have any sustain or echoe on a single clip without the clip itself being extended, that resulted in a whole mess of stair steps and interwoven clips. P.S. In my humble opinion that is THE, I repeat THE biggest thing I wish FCPX would address in their next update. PLEASE just let me apply some verb to a piece and let the sustain roll out past my clip so I can keep it nice and tidy!!! You hear me Apple?! Here is a little peak inside of each of the four Compound Clips: Digital SFX (Upper Left), SUB SFX (Upper Right), Whooshes (Bottom Left), and High Tones (Bottom Right).